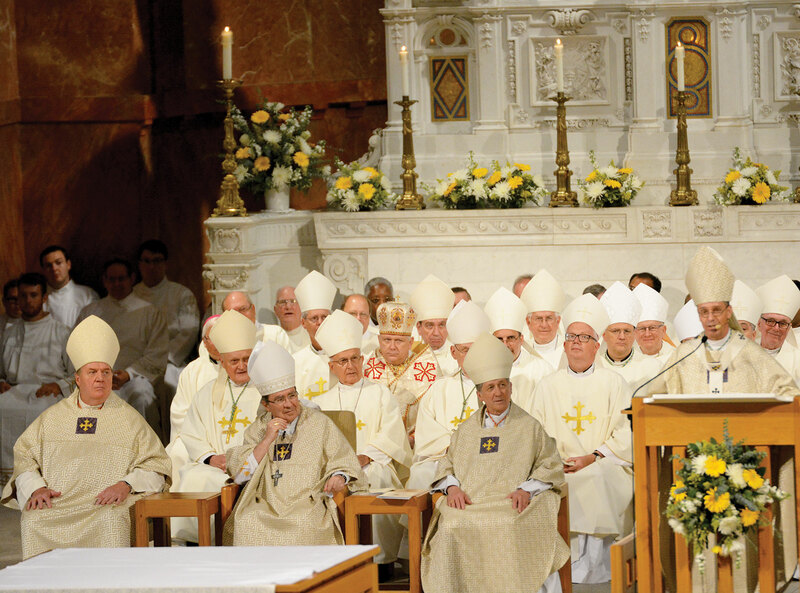 The enduring love that Cardinal Joseph W. Tobin still has for the Archdiocese of Indianapolis and the great respect he has for Archbishop Charles C. Thompson shined through in the moments before the installation Mass for his successor on July 28. “One is the friendship I have with Archbishop Thompson, and the great respect I have, and the incredible hope that he gives me—and that he also gives the archdiocese,” said Cardinal Tobin, who became the archbishop of Newark, N.J., in early January after serving four years as the spiritual leader of the Church in central and southern Indiana. “The second reason, of course, is this archdiocese which I love so much. I think that people like me, who don’t have children, you find the life in what you do with the people of God. And when you have to leave that, it’s almost like you’re handing over your children. Not that the people are children, but it’s these wonderful projects you do with them. And you hope the next person is going to love them as much as you do. A similar sentiment was shared by Archbishop Paul D. Etienne of Anchorage, who made the long journey from Alaska to be at the installation Mass for Archbishop Thompson. A former priest of the Archdiocese of Indianapolis, Archbishop Etienne has become friends with Archbishop Thompson as members of a small group of bishops and archbishops who meet and talk regularly to support each other. Being part of that same support group has created a special bond among those archbishops and bishops, Archbishop Etienne noted. It’s also given him an insight into Archbishop Thompson as a person and a spiritual leader. 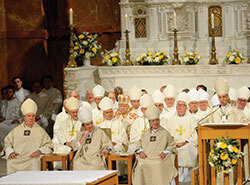 “We all know how much we need the support of each other,” Archbishop Etienne said. “And that’s why it’s important for us to make that extra effort to be there at significant moments in each of our lives. Bishop Christopher J. Coyne of Burlington, Vt., is also part of that small support group with Archbishop Thompson and Archbishop Etienne. His respect and fondness for Archbishop Thompson began when Bishop Coyne first served as an auxiliary bishop in the Archdiocese of Indianapolis and Archbishop Thompson was in his early years as the bishop of the Diocese of Evansville, Ind. Their ensuing friendship also led Bishop Coyne to return for the installation Mass of the new archbishop. “When I first got to Indianapolis, I had the chance to meet Bishop Thompson and Bishop [Timothy L.] Doherty [of the Lafayette Diocese]. They both reached out to me in friendship, and I really appreciate that,” Bishop Coyne recalled.